Have you ever wanted to get rid of a wrinkle instantly? I found a product from Bioque that is called Pronto that will diminish the appearance of forehead creases, droopy brows, crow’s feet, stress furrows, laugh lines, feathered lips, and even stretch marks and acne scars for up to 12 hours at a time—no needles required. Pronto contains 4% GABA and you will get a highly visible, super quick, 50-90% reduction in the appearance of fine lines and wrinkles. I have to say I am sorry I didn’t find Pronto sooner. I have two spots about my upper lip that have bothered me for years and when I use Pronto – they are reduced. It is so easy to use – you apply Pronto on clean, dry skin. Use only a small amount and pat and smooth into the line or wrinkle, wait two minutes for full absorption before applying moisturizers, creams, foundation, or makeup. You may have to apply a second time for deeper lines or drier skin. I do need to reapply daily but it makes me feel better seeing the lines disappear. Bioque has a whole line of skin care products that you may want to try. You can purchase Pronto or any of the other products HERE. You can also connect with them on Facebook. 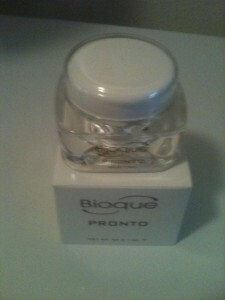 Bioque has offered one of my readers the opportunity to try Pronto themselves. You must be 18+ and have a US shipping address. Leave a comment on what other product you might like to try from Bioque. Extra entry for follow Bioque on Facebook. Extra entry for each way that you follow Kaisy Daisy’s Corner. Giveaway ends Nov 13, 2013. Enter Daily for more chances to win. I’ve earned every wrinkle on my face and neck but I wouldn’t mind some time looking younger. This looks like a great product. I went to the site and Id also like the Formula 9 firming gel. Rejuvenating Day Cream would be good. Thanks! Another product I would like to try is the Eye Restore. Eye Restore sounds incredible too! This is an awesome site to be on. Great prizes. Oh yes, to be wrinkle free! Sounds like something I would try. Liquid Gold for your face. I would like to try the eye restore cream. I’d like to try C-PLUS MOISTURIZING CREAM. REJEUVENATING DAY CREAM is the product I would like to try. I have wrinkles around the eyes. Another product I might like to try from Bioque is the VITAMIN C BODY CREAM w/ JOJOBA OIL.